A few professors at the Ben Msik campus where I’ve been taking classes this year organized a program for a group of visiting American students and their professors. I had the honor of teaching their first seminar: a two hour crash course on Casablanca. Having to cram for the Casablanca seminar right as I came home from a trip to France, and less than a month before I take off for Chicago, gave me a powerful jolt of excitement for this city, not to mention the rare feeling of having accomplished one of the goals I’d set for this year: to learn about Casablanca. There’s nothing like teaching to confirm what you’ve learned or to expose what you don’t know. To start, I asked students to give their first impressions of the city along four basic themes—the people, the buildings, the streets, and transportation. They’d been in the city for two days, long enough to have been to a range of places, namely the medina, Maarif, Habbous, and Ben Msik. Another striking sight: “pets” in the streets :-(. This one points to a minor cultural difference that comes up every time my foreign friends or I walk past a stray cat and squeal, “awwww!” Which is to say, every day. 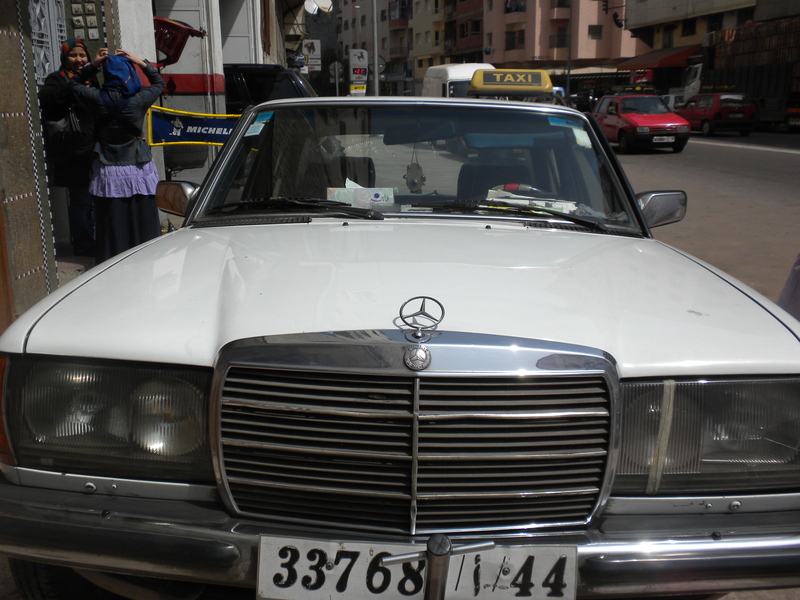 On a recent afternoon, I heard the call of “Batata! Bsla!” (Potato! Onion!) 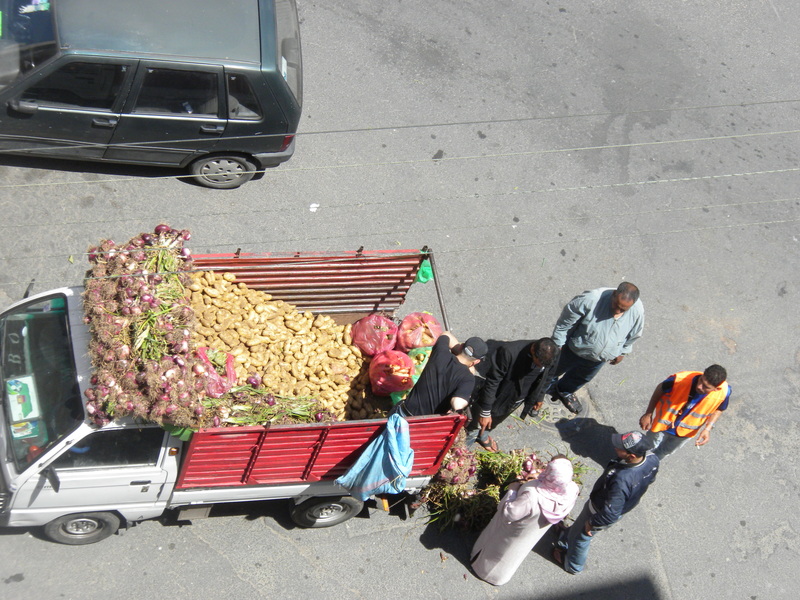 from the street and went to my balcony to attempt to capture a scene that I will miss next year: a truck, loaded with a ton of one or two kinds of fruits or vegetables, parks in front of my building, always the same intersection. One or two guys yell out the name of what they’re selling, and the price. Always in rials*, always in a rhythmic, sing-songy voice. If you’re out of the item in question, or can’t resist a bargain, you run downstairs and buy a few kilos. It’s easier to bring home ten kilos of potatoes when you’re in front of your house. It’s not so much that I need ten kilos of anything (except maybe oranges to make fresh-squeezed juice…hm…), I just love the experience. I always have to explain to the truck guys that I just can’t buy ten kilos of onions, because they will go bad before my roommate and I can finish them off. *A rial is a unit of dirhams–twenty, to be exact. As much as I loved reminiscing about Fourth of July barbeques and basking in nostalgia with my American friends, here is what really blew my mind: a bluegrass take on a hugely popular Andalusian song. The lyrics–the refrain at least, which a friend taught me and which has been playing in loop in my head ever since–basically ask, “Why worry? God will take care of me.” This was a great choice for the finale. The audience, mostly Moroccans, sang along. 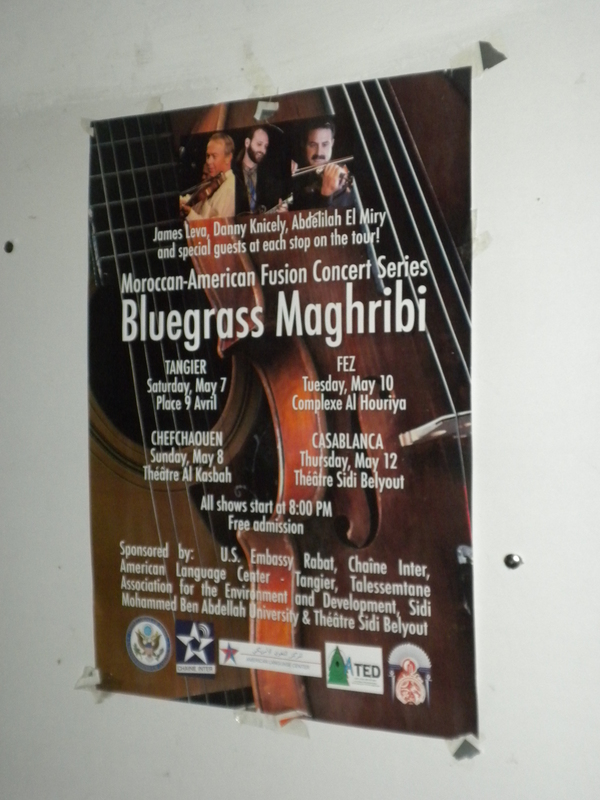 The combination of American folk music and Moroccan (Andalusian) folk music was breathtakingly beautiful. 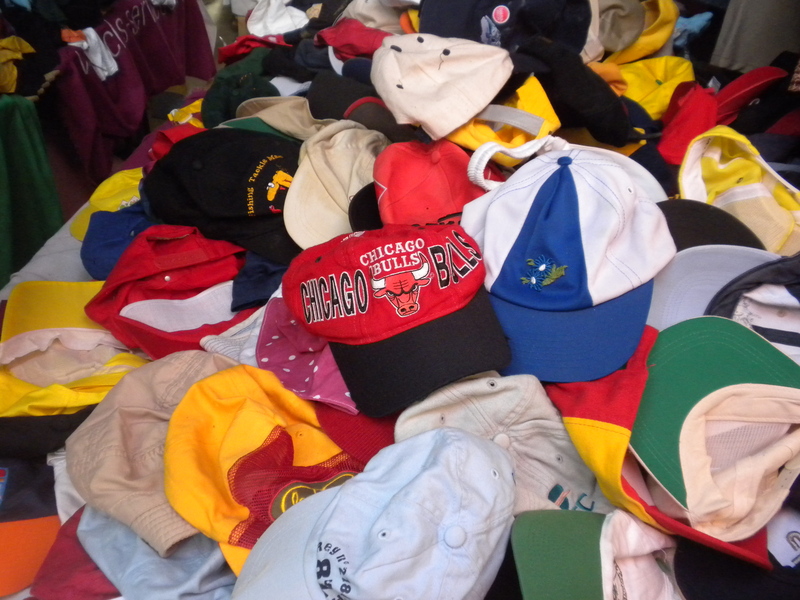 Spotted at “lbal” (the flea market) in Kenitra, a city just an hour north of Rabat. 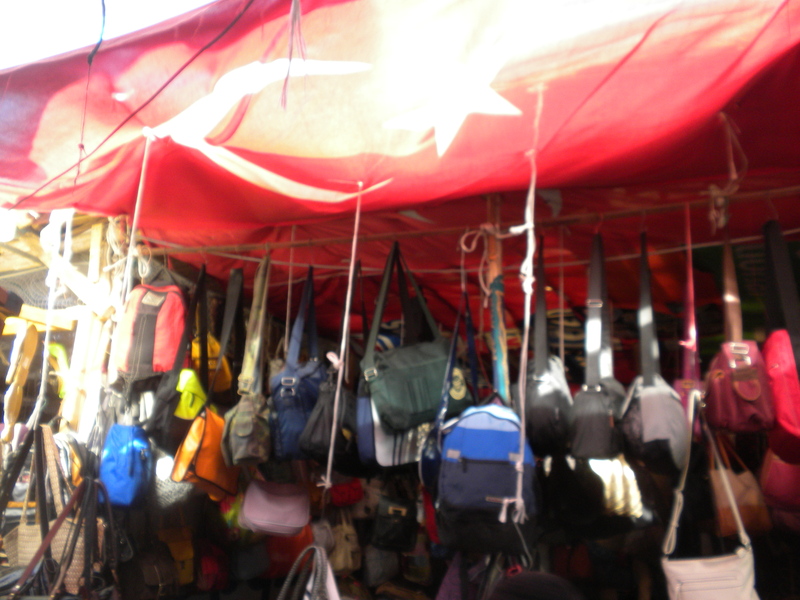 Au marché aux puces à Kénitra, à une heure au nord de Rabat. Go Bulls! (circa 1996, when I cared). Meanwhile, in the bags department…go Turkey? Allez les Bulls (même si on est plus en 1996). Sinon dans les sacs, allez la Turquie ? 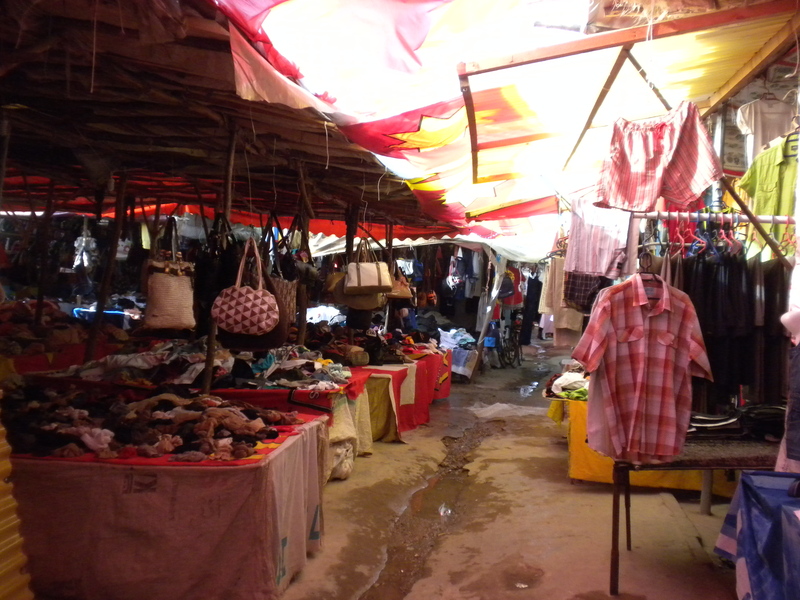 I suppose what was most exciting about this market was not so much the cheapness of it but the familiarity of the bargain clothes shopping experience I didn’t even know I missed so much. Bien entendu, ça serait de mauvais goût de me vanter des prix ici par rapport à mes magasins « deuxième main » préférés à Chicago et à Madison, alors passons. Je pense que ce qui m’a le plus emballé c’est plutôt d’avoir retrouvé l’expérience très familière du second-hand shopping. Je ne m’amuserais même pas à traduire cette expression, car c’est justement une expérience que j’associe à mon mode de vie américain. Qu’est-ce que ça me manquait ! I once asked a friend what the movie CasaNegra (2008) was about. “It’s about what life’s really like in Casablanca,” he said, darkly. Mostly, I hear rave reviews because, honestly? This. Movie. Is. Epic. The movie is set mostly in the centreville, which is incidentally right around where I live. This used to be the commercial center of town, and it’s filled with very cool and beautiful architecture dating back to early to mid-twentieth century. In fact much of the movie is shot in and around the Assayag, an architecturally innovative building dating back to 1929 where the offices of Casamémoire are now located. Check out the beautiful opening shots. Very Noir, heh. 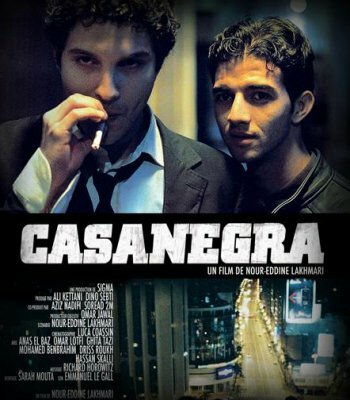 Casanegra tells the story of a couple of friends, Casaoui guys trying to make it as small-time crooks. The characters are tragic, spinning their wheels and basically powerless to improve their situation. One of the main characters, Adil, dreams of immigrating to Sweden. The other, Karim, admires an upper-class woman from afar. Each character has something they cling to for their sanity. An evil gangster for instance, the kind of guy who threatens to drill holes into people’s knees, loves his little dog above anything. One by one the characters fall apart as they realize that their dreams are unattainable and the bits of hope they cling to, fragile. At the end of the preview, the evil gangster, who’s just lost a ton of money and crashed his car, cries out the name of his dog: Nicooooooooo! Despite the tragic and dark take on life in Casablanca, the movie is hilarious and redeeming. Casanegra presents a bleak portrait of Casablanca, but the frustration of the characters and their hatred for the city are folded into what is basically an homage. Casablanca is harsh, but it’s home. It’s ugly, but beautiful. It’s urban grit–dangerous and tragic yet glamorous, even epic. Je me suis inspirée d’une vidéo du photographe québécois Dominic Boudreault, qui montre des images de villes nord-américaines, et j’ai voulu partager cette photo. C’est une pose de 8 secondes prise par mon amie Jeannette. 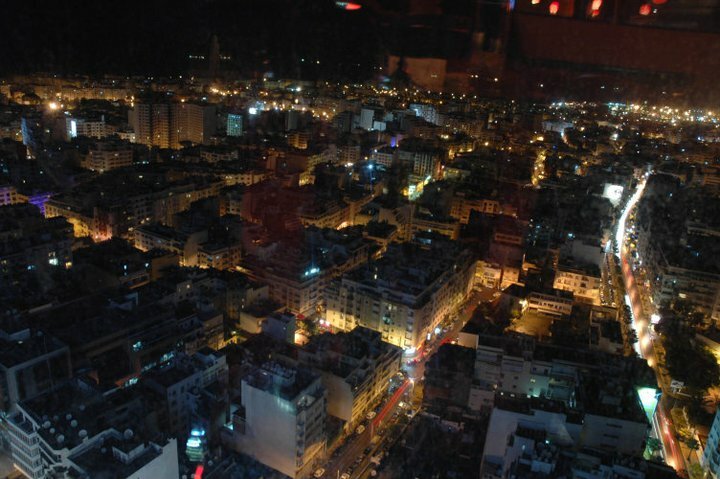 Le dernier soir de sa visite au Maroc, on s’est pris un verre en haut de la tour de l’Hotel Kenzi (une des tours du Twin Center). Du matin au soir, on peut commander un café, un verre, ou un repas hors prix histoire de profiter de la vue panoramique de la ville. (La bannière de Petit à Petit vient d’une photo que j’avais prise du haut de la tour Kenzi.) On trouve exactement la même combine en haut de la tour John Hancock à Chicago. Il faut dire que si je m’intéresse aux différentes conceptions de l’urbanité autour du monde, je suis au fond une nord-américaine urbaine qui s’attache aux gratte-ciels et qui se retrouve émue face aux perspectives dramatiques des centrevilles verticaux. I was inspired by the work of Quebecois motion photographer Dominic Boudreault‘s timelapse video of North American city skylines to post this picture. Although I love to explore different conceptions of “the city,” I am at heart a North-American urbanite with an emotional attachment to skyscrapers and the dramatic views of those dense, high-reaching skylines. The video in question features amazing views of Montreal, Chicago, Toronto, and Québec. This is the curbed version of the vehicle known as a “grand taxi.” It’ll take you (and up to 5 other passengers, plus the driver) where you need to go, if you know the hand signals to flash to the driver as he rolls past you on his route. I most often take the grand taxi from Ben Msik, where my campus is located, to the centreville. The end of the line is Bab Marrakesh, the main entrance to the old medina. For reasons that are murky to me, the signal for Bab Marrakesh is pointing vigorously to the left with the right hand. More of a windshielf wiper motion than a back and forth, “look at this guy” gesture. I always make the gesture anyway as the taxis pull up, because I’m the kind of gaouria who likes to feel the rush of knowing the codes. Look at me! I’m streetsmart! Gad Elmaleh Comédien Casaoui/Montréalais/Parisien. Tellement drole que je n’en re. vient. pas. the last of the moroccans another Ambassadorial Scholar in Morocco!